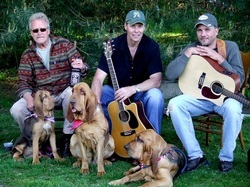 A stage performer, Big Bob (center) is a member of the band the "Porch Dogs" playing across the Midwest, he has even played at the historic "Tootsies" honky tonk bar in Nashville, TN. More importantly, he has a long history in the tree felling and tree care industry. Bob has worked as a logger on the Mississippi river bluffs, as a journeyman utility tree worker for Asplundh Tree Expert Co., and has extensive experience in residential tree service. He has been a local business owner for over 35 years as an independent insurance claims adjuster covering Northwest Wisconsin and as an Owner/Operator with Arborjack Tree Service for many years. His extensive background in tree care & tree felling combined with his insurance expertise is invaluable during consultations, tree risk assessments, and hazard tree removal.